Famous for it's expansive white sand powder beaches, Aruba has far more to offer visitors. Aruba is a great destination for summer travel as the island is outside the hurricane belt. The island offers superior beaches with crystal turquoise waters, constant cooling trade winds, stunning desert landscape in the interior, exciting nightlife and a variety of activities. Baby Beach - Located in Seroe Colorado at the southeastern end of the island. This soft sand beach is a sheltered man-made lagoon - the water is approximately 5 ft deep - great for families. Watch out for the strong currents at the point where the bay opens to the sea. Palm Beach - 2 miles of paradise! Home of Aruba's high-rise hotels, food and drink stands, water sport operators, and two piers of restaurants and shops. Excellent snorkeling. Arashi Beach - Located on the northern coast, Arashi is somewhat secluded. Popular with divers, and also great spot for swimming and snorkeling due to the calm surf. Eagle Beach - Popular beach right on the main road. Miles of white sand, calm surf and clear turquoise water. Motorized water sports, picnic areas, lots of parking available. Locals have a tradition of pitching tents on the beach during Easter weekend. Boca Catalina - My favorite snorkeling spot! Just south of Arashi Beach. You don't need a boat, tons of colorful fish right off the shore. Affordable chair rental and palapas available. Making up nearly 20% of the island’s landmass, Arikok National Park is where you will find a number of indigenous species of wildlife, flora and fauna characteristic of Aruba’s unique tropical desert climate, as well as historical sites such as the Fontein and Quadarikiri caves, which feature ancient Indian paintings. Clusters of huge tonalite boulders in an area just north of Hooiberg. These unusual rock formation rise up from the desert soil to create an unusual setting. Some of the boulders weigh several tons and feature peculiar forms. Aruba offers some of the best wreck diving in the Caribbean. You'll find most of the island’s dive sites along the protected western and southern coasts. One of the largest wrecks in the Caribbean is the Antilla, a 400-foot German freighter which dates from World War II. The Butterfly Farm is located at Palm Beach across from the Aruba Phoenix and The Westin. View butterflies from around the globe - get there early and view new butterflies emerge and take their first flight. Your admission ticket gives you a free pass for the rest of your vacation. One of Aruba‘s scenic trademarks, the California Lighthouse was named after a ship called the Californian. The ship received distress signals from the Titanic as she went down in 1912, however the Californian’s radio operator was off-duty. The Californian sunk off coast of Aruba coast a few years later. The area around the lighthouse is popular for dune surfing as well as diving. Visit with Aruba‘s colourful marine life by submarine. The Atlantis Submarine Tour is the most popular way to explore Aruba’s kaleidoscope of exotic marine life. As you descend to a depth of 130 feet, you can explore Aruba’s mysterious underwater realm of breathtaking vistas – and be sure to bring your camera to record the amazing world of brilliantly coloured coral reefs, sunken wrecks and a rainbow fantasia of tropical fish. Savanna Lodge Bar & Restaurant. Great panoramic views of the island's northern coast. Visitors wanting to experience Carnival should plan their vacations during during January and February. Carnival season is Aruba is set around several principal characters - Momo the King of Spirits, his Queen of Carnival, her Prince of Carnival, and his Fool Pancho. The streets of the capital Oranjestad and San Nichols are filled with a sea of colors, and the rhythms of steelbands, claypso, tumba, samba, road march, and torch light parades. Carnival comes to an end with the symbolic buring of the flesh with Momito (little Momo) in San Nicholas, and the burning of Momo in Oranjestad. Rent an off-road Jeep and explore the cacti forests, natural bridges, Spanish gold mines, and southern tip of the island to see what's up in San Nicolas. Arubans drive on the right side of the road, and there is NO right turn after stop as in the U.S.
Getting around is fairly easy as the island has one main road (1A) - It runs from the southern tip all the way to the northern tip. In the capital Oranjestad it's called Smith Blvd. 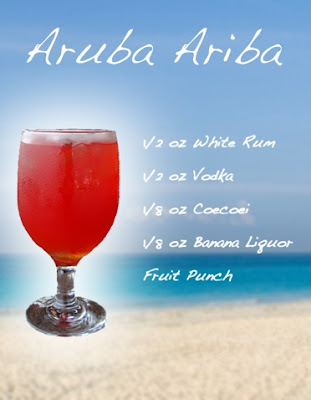 Oh - there's one extra thing to do - Try an Ariba Aruba the island’s best-known cocktail made with Coecoei, a crimson liquor unique to Aruba.